Thought the F-150 had too many options? Just look at the Titan lineup now. In 2009, Ford decided to scale back on the number of options that the F-150 had, which were so numerous that it was possible to have literally billions of differently spec'd F-150s. After the shift, the number of combinations went down to a more reasonable 10 million, though the F-150 could still be had in single, extended, and crew cab variants. 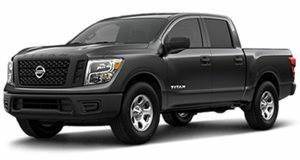 Nissan has so far only built Single and Crew Cab versions of the new Titan…until now. Today at the Chicago Auto Show, Nissan peeled the wraps off the extended cab version of the Titan that it calls the King Cab. Like most extended cab pickups, the “extended” portion comes by adding doors behind the front doors, but unlike on a crew cab, hinges them at the rear and lessens the space behind the front seats when compared to a crew cab. With all seats intact, six can sit in the Titan although buyers reserve the right to delete the rear seats to make room for cargo if the truck is being utilized for commercial purposes. After choosing between 4x2 or 4x4 drivetrains, buyers can spec the King Cab out in S, SV, and PRO-4X trims, each powered by a 5.6-liter V8 sending 390 horsepower through a seven-speed automatic transmission. This allows for a hefty tow rating of 9,420 pounds and a payload capacity of 1,640 pounds. If more is needed, Nissan has kindly extended the King Cab option to the Titan XD, which is also available with rear-wheel drive or four-wheel drive and with the same trim levels as its standard half-ton brother. The main change here, aside from getting a larger truck body, is that the 5.0-liter Cummins diesel engine mated to a six-speed Aisin heavy-duty transmission becomes an option in case 310 horsepower and 555 lb-ft of torque is needed over the gasoline engine’s 394 lb-ft. The diesel raises the tow rating to 12,510 pounds but the gas-powered XD gets a higher payload capacity of 2,710 pounds. Standard up front in either model is the choice of a front bench seat to carry more people or front bucket seats if comfort is priority. Heated seats up front are available with the SV and PRO-4X trims while heated and cooled front seats remain an option on the PRO-4X. Those that opt for the rear seat delete will also scrap the rear seat heater duct and rear roof-mounted assist grips and get a flat rear load floor and rear wall finisher with tie down hooks in its place. The King Cab Titan is aimed directly at commercial workers who will use the truck for actual work rather than for looks or the occasional trip to the off-road track with a quad in the back. Both crowds will enjoy the fact that the King Cab is covered by Nissan’s 5 year/100,000 mile warranty, making it the best in the industry. If you’re reading this from a White House server and your name is Donald Trump, there’s no need to take to Twitter because both the Titan and its engine options are built in the US of A.